The Town of Prosper is special! Community initiatives and events are forefront and hosted in Town throughout the year and we hope to see you there. Below is what’s coming up! It’s time to celebrate the completion of road construction and the nearly 40 downtown merchants open for business! A free event will be hosted in downtown Prosper featuring live music, a Memorial Day salute, Kid’s Zone, food trucks and beverages for purchase from booths featuring selections from The Gin and Silo Park. Shuttles begin at 4:00 pm from Reynolds Middle School and Prosper High School. Arrive early! Find all the details at prosperdtlive.com! Mayor Smith and the Prosper Parks and Recreation Department invite all Prosper residents to join together in fitness and walk, bike or run at least 100 miles in a little over 100 days. Register today! The 2019 PROSPER 100 MILE CHALLENGE runs February 15 through June 1, with completed Tracking Sheets due by June 6. Those who complete and submit Tracking Sheets by the deadline will be recognized at a Town Council meeting and receive a complimentary T-shirt. Resident participants will be entered to win a FitBit! Do you accept THE CHALLENGE? The annual spring clean-up event, hosted by the Town and Community Waste Disposal. The event is an opportunity for residents bring in items for disposal and recycling, such as e-waste (electronics, TVs, computers, monitors, etc), cardboard, paper to shred, metal, tree and yard waste, and miscellaneous bulk items. Free of charge to all residents. Prosper earned victories in the IT’S TIME TEXAS Community Challenge in 2016, 2017 and 2018 for demonstrating a commitment to community health and fitness. 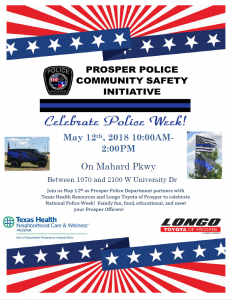 Prosper Police Department’s Community Safety Initiative (CSI) is a free annual community event to kick-off National Police Week. The event is a chance to celebrate with food, fun, education on Prosper PD and a chance to meet your local police officers. In 2018, Prosper partnered with Texas Health Prosper and Longo Toyota. The Community Picnic is an annual Prosper tradition! The event is typically held on the first Saturday in September at Frontier Park. Residents bring their families to the park to celebrate Prosper’s rich history of gathering after the fall harvest and also to celebrate small town spirit! There is complementary food and fun attractions, such as a petting zoo, pony rides, inflatable games, slides, obstacle course, toddler bounce and face painting. Keeping in tradition, Town Council members meet and greet residents; Lighthouse Christian Fellowship provide and grill hot dogs; Prosper United Methodist Church provides and serve drinks; the Prosper Ladies Association serve dessert; and members of the Parks and Recreation Board serve cookies. The Community Picnic is also a day when Prosper’s non-profit organizations are spotlighted. Prosper-based, Prosper-focused non-profit organizations set up tables to introduce themselves! Booth space is limited, on a first-come, first-served basis. Throughout the event, Bethlehem Place conducts its “Hunger is No Picnic” food drive, an annual school competition. The school that collects the most canned goods wins the travelling trophy! Folsom Elementary School took home the trophy in 2018. Along with traditional displays of outdoor lights and front porch vigils, Town of Prosper neighborhoods have participated in a variety of events over the years that have included block parties, cook outs, visits from local police, fire department and Town officials, contests, and youth programs. Participating in National Night Out is an effective, inexpensive and enjoyable program that promotes neighborhood spirit and police-community partnerships in our efforts to maintain a safe community. The Prosper Christmas Festival is the Town’s most popular event of the year, featuring holiday festivities, food and fun for all! The 2019 event is scheduled for Saturday, December 7, from 3:00 p.m. to 7:00 p.m., at Town Hall. The festival is a family-friendly event featuring numerous attractions, such as rides, entertainment, petting zoo, inflatables, toddler rides, balloon artist, mechanical rides. Of course, Santa’s Workshop is always popular! The Community Stage is a popular attraction and performances by local school children, organizations and musicians continue throughout the event. The Parks and Recreation Department is currently seeking local talent to participate in this year’s event, including artisans, craftsmen, how-to instructor and demonstrations, and youth entrepreneurs. Numerous food trucks will be on hand and a spectacular fireworks display will follow the activities of he day. Make plans to come and enjoy this community fun! The prelude to the festival is the Prosper Rotary Club and Lions Club Christmas parade. For parade information, please contact The Prosper Rotary Club. Please contact Trevor Helton with questions. The traditional Prosper Fishing Derby is typically held the last Saturday in February at the pond at Frontier Park. The event is hosted by the Town of Prosper and includes family fun and prizes for the kids! Title Sponsors for the 2019 event were Cabela’s; Edward Jones – Aaron McNeal, Financial Advisor; and PondMedics. 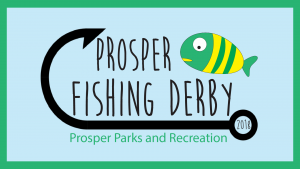 For 2019, the Texas Parks & Wildlife Department granted the Town of Prosper an exemption to the fishing license and any stamp requirement for the duration of the Fishing Derby for those who fish or volunteer for the event. The pond was stocked in advance by the Texas Parks and Wildlife Department, with mostly rainbow trout. The Prosper Fishing Derby is a catch-and-keep event for trout only, with a limit of five per person. Derby officials encourage catch-and-release.